For years, uninformed folks have declared that honey is "bee vomit." These things are inequitably false. 2. Einstein said that "if the bee disappeared off the surface of the globe, then man would only have four years of life left." 3. Honey is bee vomit. Yet people gleefully insist that honey is bee vomit. Why do they say that? Who knows? To make people stop eating it? To deter them from consuming honey as they eagerly spread it on their waffles, toast or English muffin? To make fun of people who love honey, a wonderful treat that's sometimes called "the soul of a field of flowers?" Sensational or junk "news," the kind that tabloids print without checking? Extension apiculturist (retired) Eric Mussen of the UC Davis Department of Entomology and Nematology, who retired this June after 38 years of service, says: "I make the distinction between honey bee regurgitation and mammalian vomit based on the fact that the nectar and honey being processed by the bees never have direct contact with food being processed, or expected to be processed, 'digestively' as is the food in a mammalian stomach." Glad to know it's not "vomit," but even though, TMI. If it goes down their little bee throats and comes back up, it is vomit. One man's opinion does not change the fact that bees regurgitate nectar. I don't care where inside them it comes from. Vomit is vomit. What I find fascinating is how does this nectar get funneled to the correct stomach ? But I sort of also agree with Alicia, vomit is vomit, and regurg is regurg. Meriam-Webster defines Vomit. 1: an act or instance of disgorging the contents of the stomach through the mouth; also : the disgorged matter. Since the nectar does not come from the bees stomach. it is not "Vomit" as defined above. @ Sam Albright, "also : the disgorged matter." Disgorge: cause to pour out. "the combine disgorged a steady stream of grain"
"the bee disgorged the nectar and bee-gut-protein cocktail into the honeycomb via its mouth." So, allowing that it is disgorged by the bee and is in fact physical matter, honey by Mr. Websters definition is vomit. However! Since it is technically not yet honey but a "nectar and bee-gut-protein cocktail" until it is dehydrated by the fanning of wings after which it becomes honey, I suppose honey is less bee vomit and more dehydrated bee vomit with natural preservatives. So maybe it is vomit and maybe not vomit. It tastes so wonderful--who really cares? That's God's handiwork. It's a treat; just enjoy the honey. Bees are incredible creatures-they're our pollinators. I like "bee vomit." the digestive tract of a honey bee." Honey is still an animal product. So as a vegan I choose not to consume honey. LOL @ the vegan... Okay, I'll take your share of this yummy natural non-cruel animal product that's super healthy for you! Yummmm Honey!! Or bee vomit for you non believers 😜 I'm still going to plant enticing flowers for them and partake of this wonderful gift!! I understood what they are trying to explain... Allah is great... That system what bees have we people can hardly understand.... But it's blessing for us from Allah... It is definately not the vomit. Who cares if it is vomit or not--we have been eating it for thousands of years. I'm not going to STOP eating it. There is much worse things out there that we eat and we haven't stopped eating them. So why now? Apples have wax on the skin that can kill you from pesticides. So really, people! with Bee vomit ON IT. ! Remember, digestion begins in the mouth. Enzymes breakdown constituent nutrients. Most people wolf their food down. Mom was wise to say "chew your food!" Honey is NOT non-vegan. It comes from nectar that is plant based. God didn't make the bee vomit, Gary. The bees made the bee vomit. It is bee vomit, though. Digestion starts in the mouth and the esophagus is part of the digestive system. If something goes in a bee's mouth and through its esophagus, part of its digestive system, and then comes back out the same way, it's vomit. Bees only have an esophagus for digestion since they don't use it for respiration. It's bee vomit from its special storage organ not used for digesting its food, but instead for turning nectar into honey. Then it regurgitates, aka vomits, this material back up its esophagus, part of its digestive system, back out of its mouth, where digestion began. If "bee vomit" offends you or disgust you, you're going to spend most of your life offended and disgusted. I enjoy bee vomit, it's delicious! Evidently some people can't take a joke. I eat bee vomit. Same as I eat cow solidified mammary secretions fermented and aged with bacteria and enzymes. Joking about foods in terms that our oh so fastidious society takes issue with due simply to foolish cultural indoctrination is just that, joking and poking humor at what we consider gross. It doesn't stop anyone from eating such things, and if it does....eh....more tasty bee barf and fermented cow secretions for the rest of us. Thank you for this information and please tell me more. I wouldn't care if it came out their butts! It be delish! And if they eat something and later on it comes back, that's vomit. Even if a pasta salad comes back so fast, it is indistinguishable from uneaten salad, it's still vomit. So honey is vomit. Delicious vomit! Have always thought of it as bee spit. If you hack something up from the back of your throat (esophagus) you wouldn't call it vomit. It's not vomit because it's not the contents of the stomach. Reading comprehension, please. You can't just pick and choose phrases out of a statement and disregard the rest of the context of it. This is some pedantic hair splitting. At the end of the day it's the same thing unless you're an overly literal robot that can't decipher context. I went though all that eating some honey-covered cereal and it still tasted fantastic. 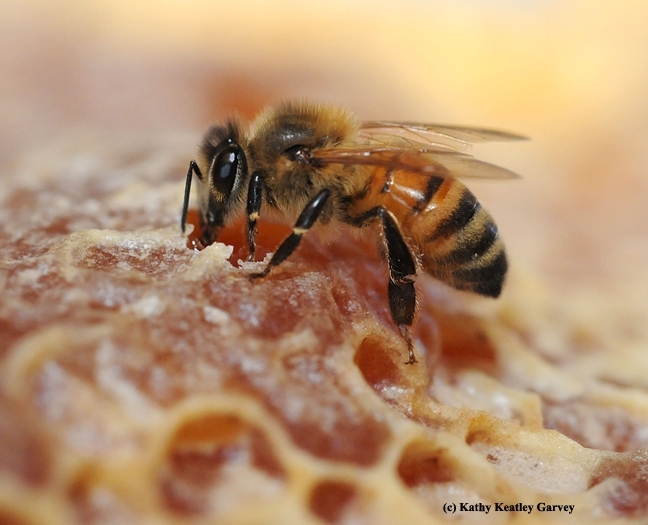 What I know is that honey is secreted from the pharyngeal glands, so it's not a bee vomit. @Dana Madison, it is an animal and vegetable product at the same time! So it's bee diarrhea. Got it.